Lake McKenzie, a popular fresh water swimming hole stop on the Unesco Heritage site Fraser Island tour. Queensland, Australia. 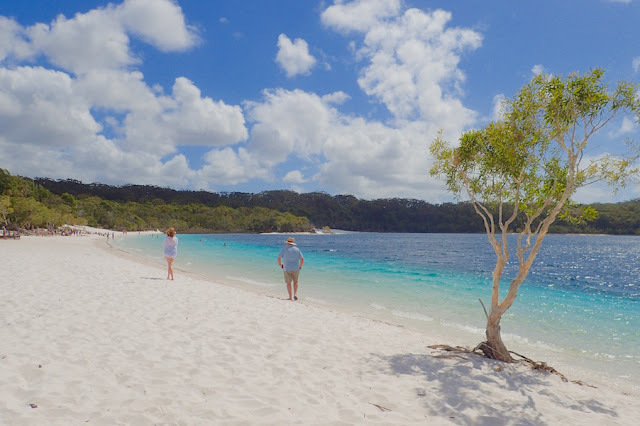 Even if it did hit several of Unesco Word Site Fraser Island's* top spots and included lunch, we chafed at popping $185 AUS (about $131 USD) / person for a 7:50 am - 4:40 pm guided tour. 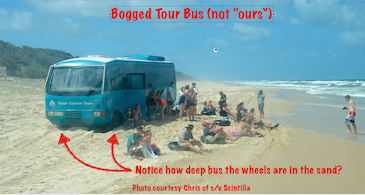 Purportedly -- if we could get it -- it would cost more to rent a 4-wheel drive vehicle by the time all the fees were paid than to take the Fraser Island guided tour. 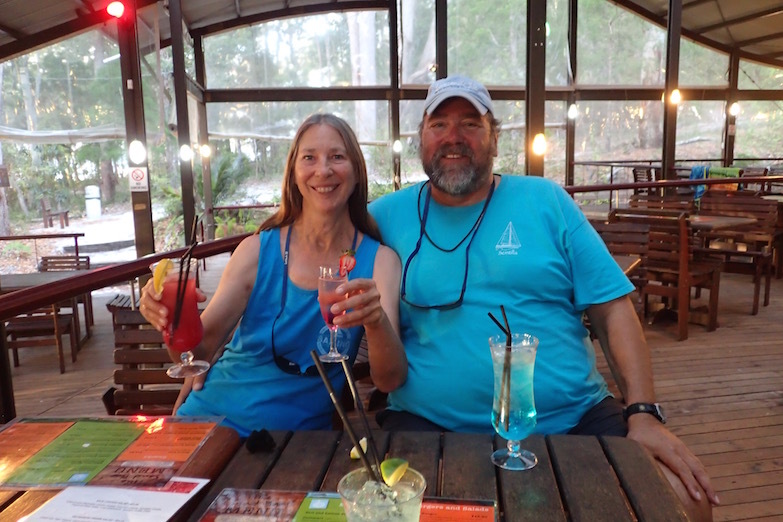 Somewhat reluctantly, we made the required night-before reservations via credit card for the Fraser Island Discover Beautiful Places tour. Seeing Fraser Island was one of the reasons we chose to check into Australia via Bundaberg, rather than entering further South and checking in at Brisbane instead. the dingos. Alas, we did not see any on Fraser Island. *Fraser is the largest sand island in the world. Part of what makes it unique is the coating around its sand granules provided viable building blocks for life, leading to verdant forests and a whole host of other happy flora and prolific fauna. 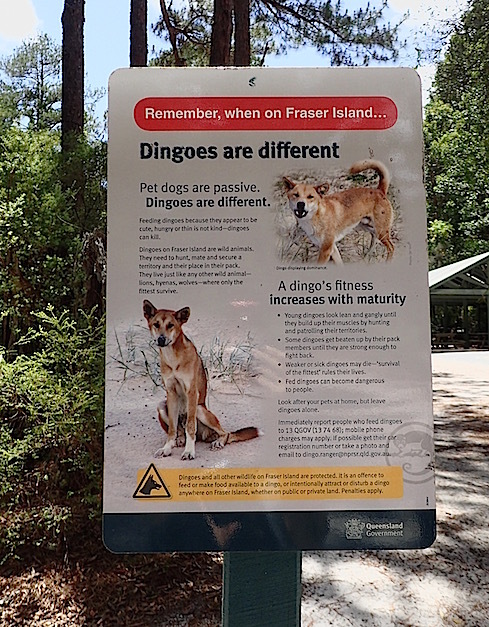 Wild dingos are Fraser's big draw. Australia's earliest human settlers brought them along for food. All paid up and ready to roll early, we checked our watches and wondered why our “7:50 am sharp!” tour bus had yet to arrive by 8:20. Little did we know that delay meant we were in for a lucky break! Turns out our scheduled guide didn’t know he was scheduled and went incommunicado. Instead, Peter, the guide we got, was still waking up from his breakfast when he showed up as our stand-in. Granted, we have no ability to compare Peter to our originally intended guide, but it’s hard to imagine anyone else funnier and more knowledgeable than the famed Australian wildlife photographer Peter Meyer and Fraser local for 20 years. Peter's stories kept us in stitches, and his running commentary added a just the right level of context to better appreciate and understand what makes Fraser unique. At the same time, you're never quite sure when Peter's telling a yarn or the truth. 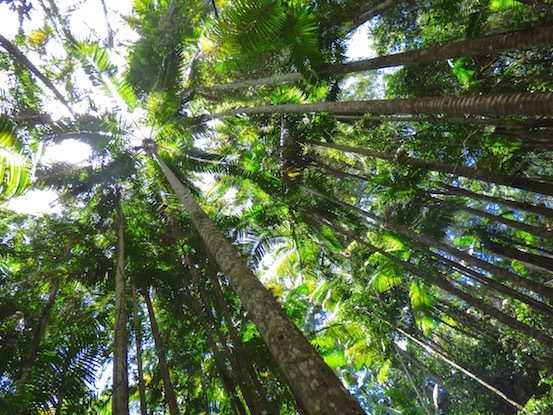 Looking up at the rainforest canopy, Central Station, Fraser Island, Queensland Australia. 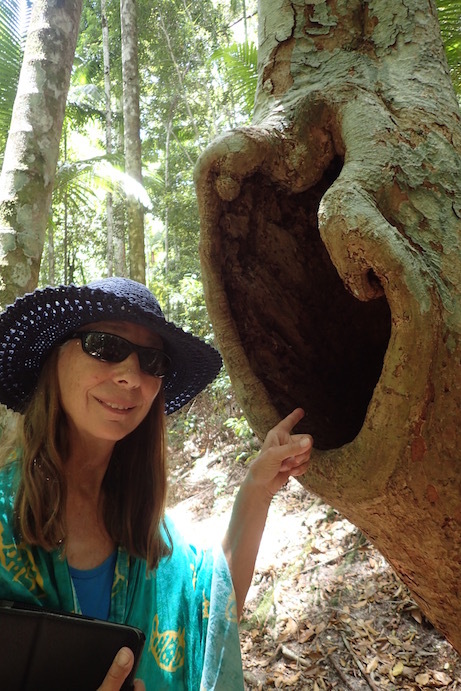 For example, Peter told us "There are no koalas on on Fraser Island. So I picked up a toy koala and put it up in a tree, waiting until someone on my tour 'discovered' it. I'd stop, and out would come the cameras, clicking away. Eventually they'd notice the koala had a backpack on.... The ranger made me take the koala down." Sand "roads" of Fraser Island, Queensland Australia. Photo courtesy of Chris of s/v Scintilla, taken from "our" bus front seat. Fraser is criss-crossed with deep sand roads, theoretically 2-way, but one car width wide - not sure if our GPS would apply there! When two vehicles meet, one -- generally the rental -- has to back into a pullout for the other vehicle to pass. As we lurched, bumped and rolled down the roads, I found myself voluntarily and without prompting, strapping myself in with the seatbelt. Peter had a variety of colorful names for various places travelers regularly got stuck along the road, pointing them out as we passed them. 75 Mile Beach, East Coast, Fraser Island, Queensland Australia. The beach is drivable - in theory! The day of our tour, Peter was narrowly spared from saving another tour bus that "got bogged" (mired) in the sand on 75-mile beach. Another guide was able to help the stuck bus driver out before we did. According to Peter, busses have gotten stuck long enough that tides flooded their interior. These Fraser Island seeds release only when there is a fire. Queensland Australia. Our first stop was at Lake McKenzie, a fresh water lake of turquoise shallows bordered on one side by a beautiful white sand beach and the other side by deeper, royal blue waters. Sparse sculptural lakeside trees enhanced the surreal landscape effect. Lake McKenzie made an inviting swimming hole, though for those of us changing into and out of swimsuits and also partaking in the tea and cookies, there wasn't much time for swimming. Carpet python, Fraser Island, Australia. Harmless. After Lake McKenzie we stopped off at Central Station, the island's tropical rain forest, where we got a chance to stretch our legs and learn more about the remaining trees, as the area was once heavily logged. Eco-tourism's replaced timber as Fraser Island's economic lifeblood, driving the protection of the areas natural resources. "the Greenies in the 70s got it started," Peter explained. Central Station used to be a train stop, to transport felled timber for export. Native dawn ferns, casting their lofty umbrellas over Central Station's stream were stunning, as was the whole forest canopy. Ironically, there were even imported and now mature California sequoias - which made me feel at home in an odd sort of way. Tall, wide satanay pines were the native grand-daddies of the forest. We also saw more kauris than in New Zealand. What really made the Central Station stop and our whole tour was when Chris of s/v Scintilla spotted a handsome carpet python. 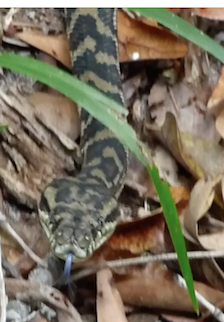 It was close enough we could see the python's blue tongue flicking, as it leisurely made its way from one side of the trail boardwalk, underneath us to the other. Unlike many Australian plants and animals, carpet pythons are not poisonous and do not attack humans. where we found a skink. Fraser Island, Australia. From Central Station we stopped off for a generous though not particularly memorable buffet lunch at Eurong. Eurong is now owned by the same folks as the far more glam Kingfisher Lodge, which is where we anchored near and began the tour. Peter rounded up his ducklings just as we were finishing lunch, and our next stop was for those folks interested in taking a 15-minute Cessna flight over the island for $80 AUD. "One of the few places in the world where you can take off and land on a beach," we were told. Tempting, and not too outrageously priced, but my tight purse strings won out over my curiosity. The folks who took the tour seemed satisfied with it. The much-photographed wreck of the SS Maheno was our next stop. Once a luxury liner, built in 1905, the Maheno wrecked and eventually washed ashore Fraser Island in 1935. Time and tides have not been kind, though after 81 years it's amazing anything is left. The beach surrounding the wreck is quite stunning, which caught my interest more the wreck, thronged with tourists. 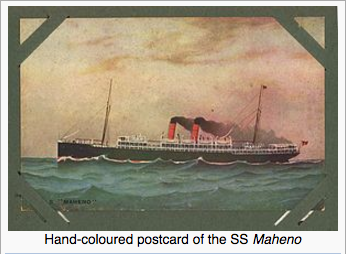 SS Maheno in its heyday. Image pilfered from Wikipedia. 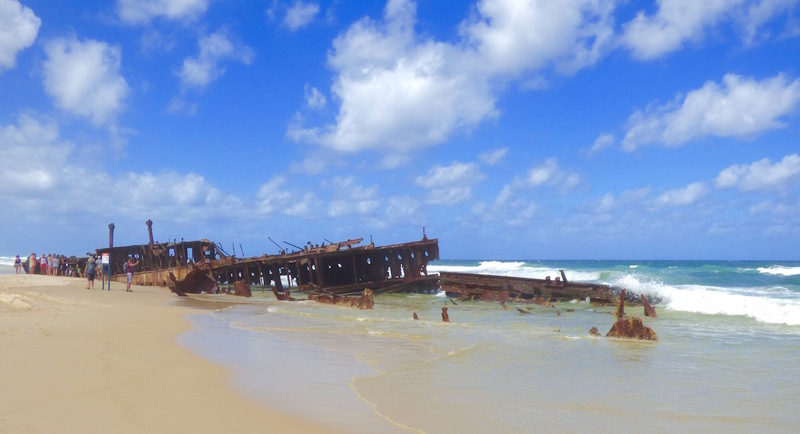 SS Maheno today, what's left, wrecked on the shores of Fraser Island's 75-Mile Beach since 1935. Queensland, Australia. 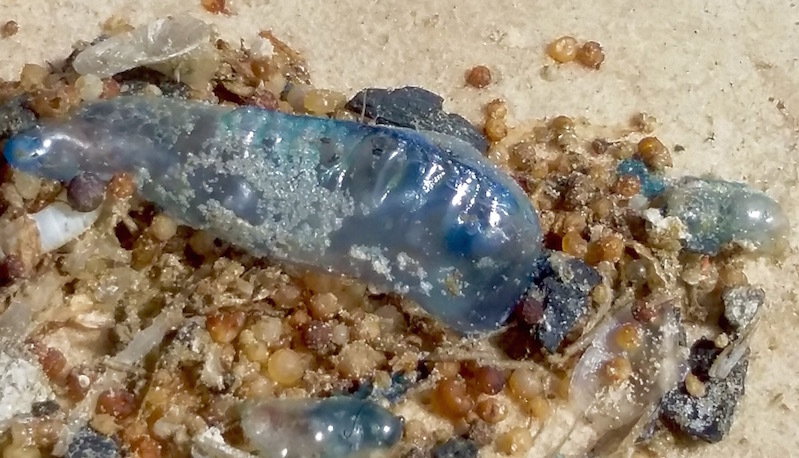 Still, eagle-eyed Chris saw a cool blue jellyfish washed ashore that I was too distracted to see (photo is hers). A good reminder to not swim in these waters! A rough undertow and sharks keep swimmers on shore. Jellyfish near the wreck of SS Maheno, Fraser Island, Queensland, Australia. Photo courtesy Chris of s/v Scintilla. The colorful sandstone cliffs of the Pinnacles marked our turnaround point. Much as we appreciated the bright, sunshiny day, visiting them in early morning or that just-a-little-before-sunset golden light would've made for far more glorious lighting to for viewing and photography. 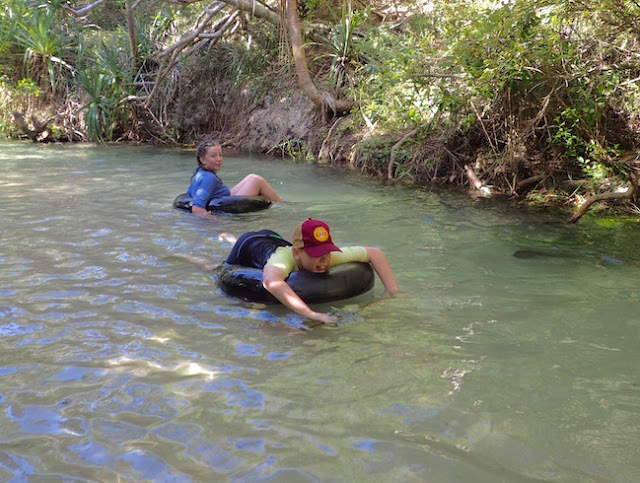 Eli Creek, a tributary leading to the sea gave us another opportunity to take a final afternoon dip. A boardwalk leads to a spot upstream that invites a drift, some float, some 'tube it, like the trio of our 20-something hitch-hikers, along for the ride. We waded instead of drifting when we heard one of our fellow passengers comment the stream was shallow enough she bumped bottom several spots along the way. Inner tubes. Best way to go down Eli Creek. Fraser Island, Queensland, Australia. We also stopped off at the colorful Pinnacles, our furthest North stop along Fraser's surf-torn East Coast. Pretty, though in an ideal world, catching it in more subtle or golden light would've made its beauty far more photogenic. Even in flat afternoon light, Fraser Island's sandstone Pinnacles are still colorful. Queensland, Australia. 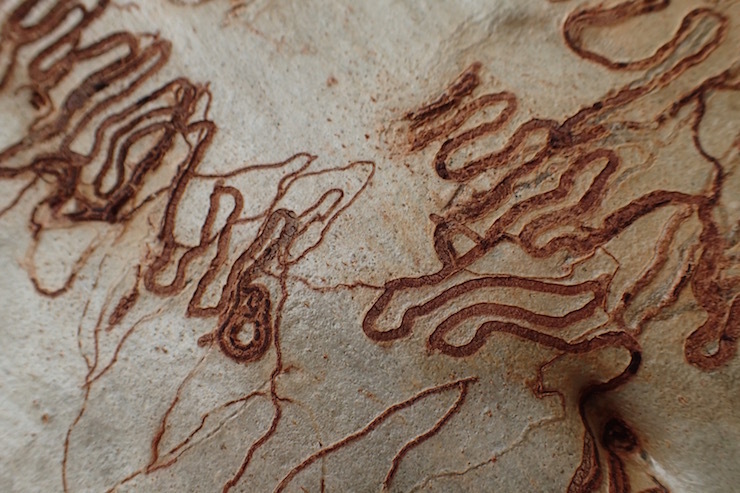 This is not sugar-gum tree graffiti, but moth larvae from an earlier life phase eating their way through the trunk's bark. Fraser Island's normally rippled sand dunes got a bit of a face-lift from the recently shifted winds. Thus they were smooth and not terribly exciting in the distance and the flat afternoon light. Thus, Peter chose that time to point out the designerly efforts from the larvae of a moth in the trunks of the sugar-gum trees. They burrow their under the bark, making an intriguing embroidery-like pattern as they feed and eventually eat their way out from underneath before they transform into moths. 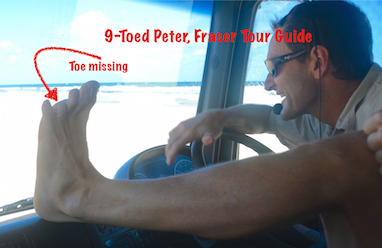 We’re exceptionally grateful Peter’s first and boyhood visit to Fraser, where he lost a toe hot-rodding a motorbike into a tree didn’t put him off on the island – hence the “9-toed tour.” We’re betting tons of other Fraser visitors lucky enough to enjoy the island under his wing will feel the same. after the Fraser Island tour. We toured Fraser Island (S25.22.852 E153.01820, near Kingfisher Lodge) a few days ago, November 19-24, 2016. We are currently on passage between two Brisbane area anchorages, from Scarborough Marina (S27.11.606 E153.06.370) to Manly. 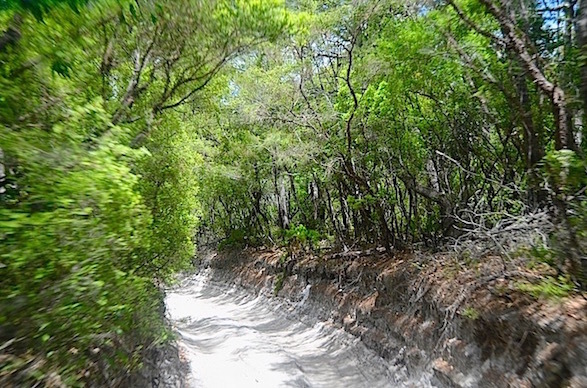 There are still a few more posts from Fraser Island coming as well as a few final catch-up posts from New Caledonia. Fraser Island tour map, pilfered from Nomad's Fraser Island Tours. Queensland, Australia. Our September 2016 sail from Vanuatu to New Caledonia was 305 miles. Our August 2016 sail from Fiji to Vanuatu was 525 miles. We cruised just under 440 miles in Fiji, between late May and early August. Our May 2016 sail from New Zealand to Fiji was 1090 miles. December 2015 - May 2016 if we weren't cruising New Zealand or hunkering, we were making massive road trips from New Zealand's tip to its tail. From December 2014 - November 2015 we sailed from Northern Florida's Atlantic side to New Zealand, over 10,000 miles, with more than a few stops in between. December 2013 - May 2014 we sailed 1792 miles from Jacksonville Florida to the Bahamas. and back. March 2012 we bought Journey in St. Lucia. September 2012 we moved aboard, did some boat work, then sailed her to Jacksonville Florida by June 2013, 3762 miles. After Brisbane and Gold Coast, we’ll mosey on down to off to Pittwater, near Sydney by early December 2016 for boat work. Weather permitting, we’ll stop along the way whatever else strikes our fancy. Labels: Fraser Island Queensland Australia, Kingfisher Lodge Fraser Island Australia, Peter Meyer Nature Photography, South Pacific Cruising destinations. Very nice post here and thanks for it. I always like and such a super contents of these post. 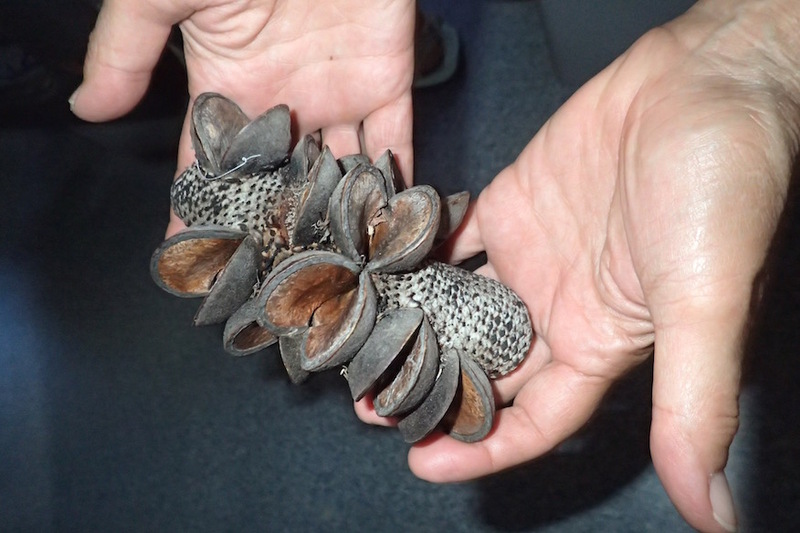 New Caledonia > Australia – Arrived!